Lumbar instability is an important cause of low back pain and can be associated with substantial disability. The word ‘instability’ is still poorly defined. But it is most widely believed that the loss of a normal pattern of spinal motion causes pain and/or neurologic dysfunction. The American Academy of Orthopaedics Surgeons  state: ‘Segmental instability is an abnormal response to applied loads, characterized by motion in motion segments beyond normal constraints.’ Panjabi published a spinal stabilization system represented by 3 subsystems: the passive, the active and the neural control subsystem. Within lumbar instability, we distinguish functional (clinical) instability and structural (radiografic) instability. Functional instability, which can cause pain despite the absence of any radiological anomaly, can be defined as the loss of neuromotor capability to control segmental movement during mid-range. Whereas structural or mechanical instability can be defined as the disruption of passive stabilisers, which limit the excessive segmental end range of motion (ROM). There is also a possibility to have a combined instability. T. Barz etal. 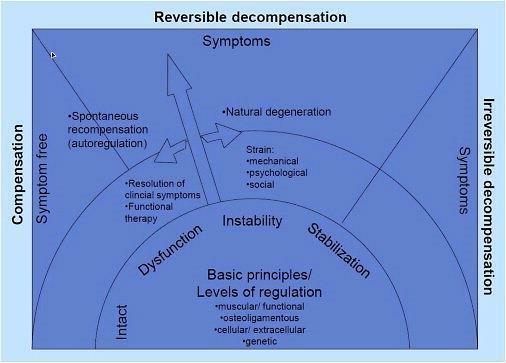 proposed a new conceptual model of compensation/decompensation in lumbar segmental instability (LSI). 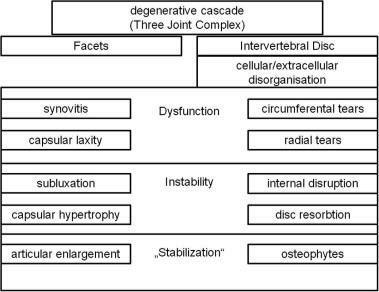 In LSI, structural deterioration of the lumbar disc initiates a degenerative cascade of segmental instability (see figure 1). Over time, radiographic signs become visible (see etiology). Influenced by non-functional factors (psychosocial factors), functional elements of the spine (ligaments, muscles) allow a compensation of degeneration. This may lead to an alleviation of clinical symptoms. In return, the target condition of decompensation of LSI may cause the new occurrence of symptoms and pain. Individual differences of identical structural disorders could be explained by compensated or decompensated LSI leading to changes in clinical symptoms and pain. The neuromotor control subsystem controls segmental motion during the mid-range, while the osseoligamentous (passive) subsystem limits segmental motion at the extremes of lumbar motion. Abnormal segmental motion noted on kinetic MR images is closely associated with disc degeneration, facet joint osteoarthritis, and the pathological characteristics of interspinous ligaments, ligamentum flavum (hypertrophy) and paraspinal muscles. Other spine pathology such as annular tears or traction spurs has also been associated with segmental instability. When a disorder or injury occurs, the whole motion segment is affected and the degenerative cascade begins which can lead to the symptoms and signs of LSI (see figure 2). A constant morphological modification of the spine alters the biomechanical loading from back muscles, ligaments, and joints, and can harvest back injuries.Granata et al., described that body mass, task asymmetry, and level of experience affected the scale and variability of spinal load during repeated lifting efforts. In older people, bending and lifting activities produce loads on the spine that exceed the failure of vertebrae with low bone mineral density, which is linked with spinal degeneration. The degenerative transformation has influence on the intervertebral discs, ligament and bone. A visually observable or palpable hitch at a moving segment in the lumbar spine, mostly during change of position. Segmental shifts or hinging associated with the painful movement. Moving or jumping of the vertebra accompanied with pain in active trunk flexion or deflexion. An increased mobility at the concerned movement segment, mostly in passive segmental lumbar flexion and extension. Excessive intervertebral motion at the symptomatic level or an increased intersegmental motion at the level above the concerned movement segment. Low back pain during long static load and deflexion. Pain during change of position and while bending or lifting. An abnormal motion sensation in postero-anterior movements of the vertebra. Decreased activation of stabilizing muscles. Disruptions in the patterns of recruitment and co-contraction of the large trunk muscles (global muscle system) and small intrinsic muscles (local muscle system). This affects the timing of patterns of co-contraction, balance and reflexes. Pain and the observation of movement dysfunction within the neutral zone. Gowers sign: the inability to return to erect standing from forward bending without the use of the hands to assist this motion. Frequently crack or pop the back to reduce the symptoms, self-manipulation. Functional flexion-extension radiographs taken at the end-range of movement are the most frequently used, but show only the function of the passive stabilizing subsystem and fail to address the active and neural control subsystems. Neutral radiography:Shows many indirect signs that are associated with spinal instability. Functional radiography : Functional radiography in the sagittal plane can occur in flexion and extension or with passive axial traction and compression. Intervertebral instability or abnormal motion between two vertebrae can be observed. Dynamic radiographs obtained in both flexion and extension, determine motion segment instability and can also indicate the lesions located in specific areas. Magnetic resonance imaging MR imaging is commonly considered to be the most accurate imaging method for diagnosing degenerative abnormalities of the spine and is often used for the diagnosis of patients with chronic low back pain. Intraoperative measurement system :This technique is recently developed and implies in vivo measurements of vertebral segment displacement during the application of a controlled load to produce motion.The operator grasps the spinous process to move it caudally. A device is developed to preserve the supraspinal ligament after clearing the paravertebral muscles and hammering the two pins into the two spinous processes lying on either side of the lumbar vertebrae so the stability can be measured. Computed tomography: CT can show spinal degenerative changes and facet joint orientation. It can demonstrate predisposing anatomic factors, such as facet joint asymmetry. If a CT scan shows a gap in the facet joints during rotation of the trunk, this could be an indirect sign of spinal instability. Quantitative Stability Index (QSI) QSI is a novel objective test for sagittal plane lumbar instability. A QSI > 2 standard deviations from normal in an asymptomatic and radiographically normal population, would indicate that the amount of translation per degree of rotation is abnormal. A QSI = 4 would indicate far greater instability. 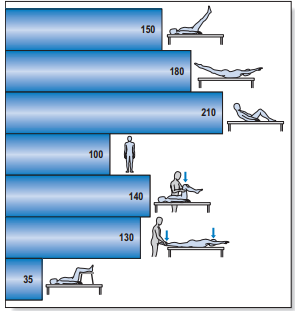 Oswestry Disability Index: subjective percentage score of level of function (disability) in activities of daily living in those rehabilitating from low back pain. The Quebec back pain disability scale (QBPDS) is a condition-specific questionnaire developed to measure the level of functional disability for patients with low back pain. The end score will be between 0 (no limitation) and 100 (totally limited). The minimum clinically important difference is 15 points when suffering acute low back pain of chronic low back pain. This questionnaire is designed to assess self-rated physical disability caused by low back pain. o When the score at intake is < 9 points; Minimal detectable change (MDC) = 6,7 points and the minimum clinically important difference (MCID) is 2-3 points. o When the score at intake is > 16 points: MDC = 8,6 points and MCID = 8-13 points. This useful questionnaire can be used to quantify activity limitation and measure functional outcome for patients with any orthopaedic condition. The Minimal detectable change (MDC) is for chronic pain = 2 points, for low back pain = 1,4 points and the minimum clinically important difference (MCID)= 2,0 points. Stratford et al found the average of the MCID scores for 3 activities to be 0.8 (“small change”), 3.2 (“medium change”), and 4.3 (“large change”) PSFS points in patients with chronic low back pain. In acute overt instability, stabilization of the spine is required in all cases. In this context, medical treatment refers to the use of external bracing for spine stabilization. If instability is due to an osseous fracture, if the fracture fragments can be reduced to near-anatomic alignment, and if there is no significant neural compression after reduction, the patient may be treated nonsurgically with a brace until the fracture heals. But when conservative treatment fails, this may be reconsidered. Another part of the medical treatment is medication. Depending on the complains of the patient and de physiological indication, analgesics, anti-inflammatories, muscle relaxants can be prescript. Surgery should always be the last option, because it’s never without risks. The main problem of fusion is the disruption of the biomechanics of the rest of the spine; leading to adjacent level disease.Level evidence: 1A There are different ways to fuse a spine segment. Anterior approach: The intervertebral disc is removed from a front approach (trough the abdomen) and replaced with bone graft or instrumentation. Posterior approach: This surgery is either the same as the anterior approach, but from the back or there’s a fusion of a segment. Combined approach: In some cases, it’s not possible to complete the fusion only from the front or the back. In this scenario the surgeon will reach the spine from both sides. Instrumented fusion: Utilisation of titanium, titanium-alloy, stainless steel or non-metallic material to replace the intervertebral disc. Non-instrumented fusion: Also known as arthrodesis. This type of surgery uses bone graft to replace the original intervertebral disc. Patient education is important in the treatment of patients with segmental instability.This education should not only focus on the moments that the patient should not perform. But it should motivate the patient to stay active, knowing which movements shouldn’t be or with great care performed. These movements are loaded flexion movements, as they may create a posterior shift of the disc. level of evidence 1A And any end-range positions of the lumbar spine should also be avoided because these overload the posterior passive stabilizing structures. The abdominal muscles, particularly the transversus abdominis and oblique abdominals, have also been proposed as having an important role in stabilizing the spine by co-contracting in anticipation of a tested load. However, exercises proposed to address the abdominal muscles in an isolated manner usually involve some type of sit-up manœuvre that imposes dangerously high compressive and shear forces on the lumbar spine [, level of evidence 5 ] and may provoke a posterior shift of the (unstable) disc (see figure 5). Moderate evidence suggested that back schools have better short- and intermediate-term effects on the functional status and pain than other treatments for patients with recurrent and chronic low back pain (LBP) Moderate evidence suggests that a back school for chronic LBP in an occupational setting are even more effective than the other treatments. Patient education may be important in the treatment of patients with segmental instability. Education should, first of all, focus on preventing loaded flexion movements, as they may create a posterior shift of the disc. Therapy and exercises are useful. The effectivity of back school program has been shown and is more effective than any educational intervention. The exercise programme is based on training the patient to draw in the abdominal wall while isometrically contracting the multifidus muscle, and consists.